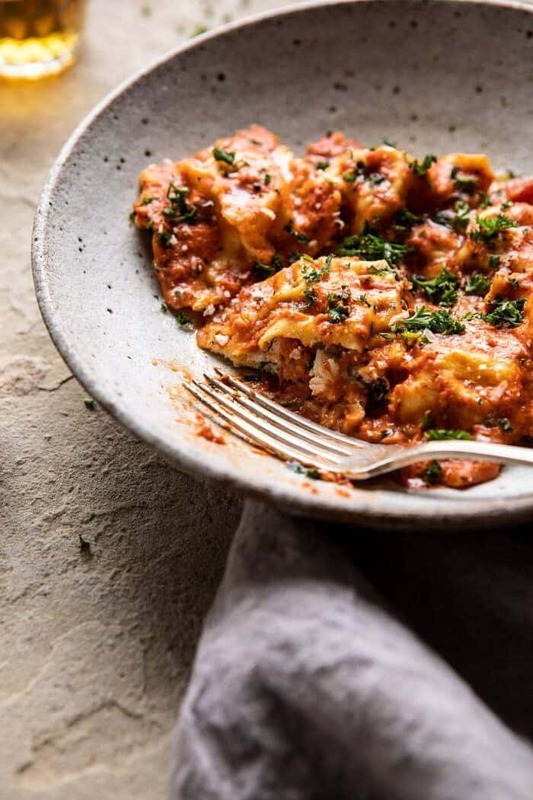 Making Monday fancy…ish with my homemade Brown Butter Lobster Ravioli with Tomato Cream Sauce. 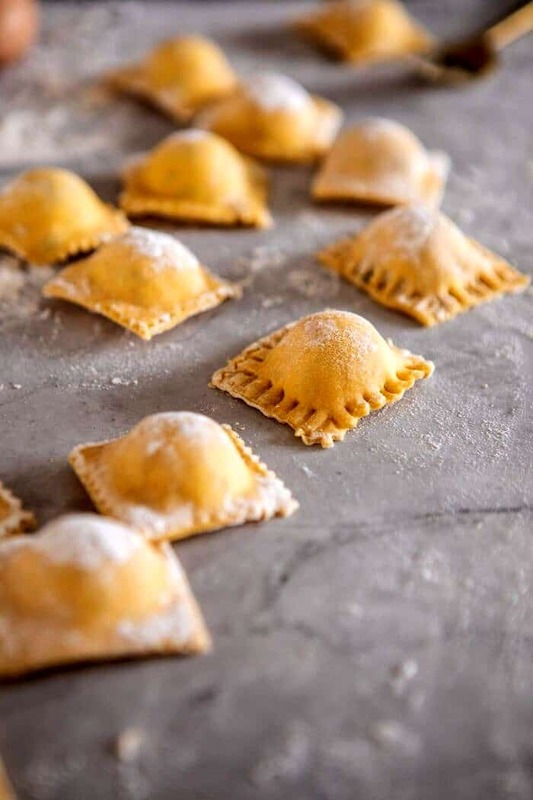 Fresh pasta dough (or wonton wrappers to keep things easy) filled with a simple but delicious nutty browned butter lobster and ricotta cheese filling. 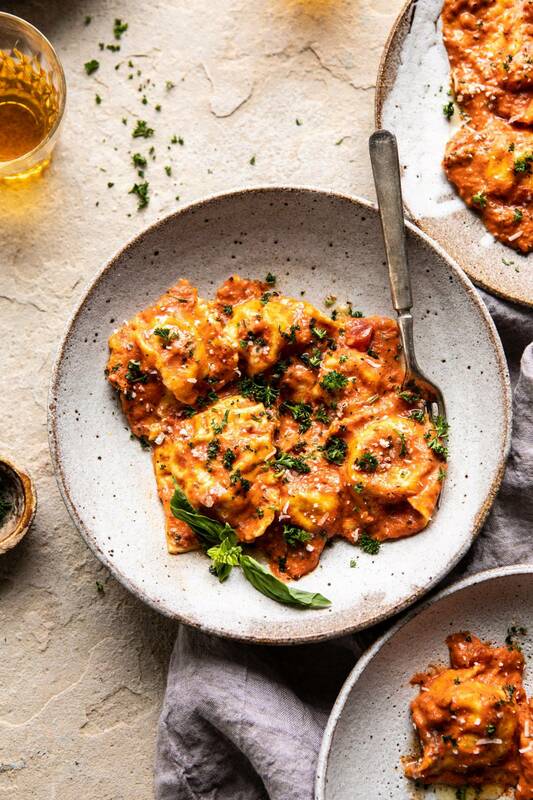 Serve this homemade ravioli with a delicious creamy tomato basil sauce that truly compliments the delicate, buttery, herby flavors of the lobster. 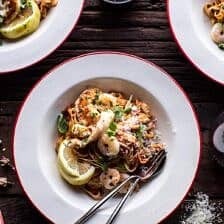 This is the perfect date night pasta to make anytime you’re looking for a special dinner to enjoy at home. I debated back and forth about sharing this recipe, because really, will you make homemade ravioli? It’s the question I am still asking myself at this very moment. The truth is, while I know it’s my easier, quicker, simpler recipes that are typically most popular, this recipe really excites me too. Therefore, I couldn’t just not share it with you guys, it’s just too good. And while it might not be something you can make on a busy Monday night, it is something you could make for special occasions (hello to Valentine’s Day this coming Thursday), or for a nice Saturday night dinner. We all need a special occasion dinner sometimes, don’t we? Yes we do. 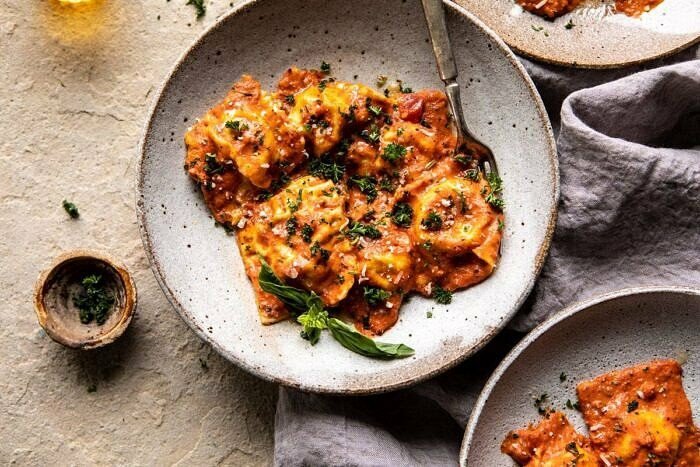 And let’s be real, if you can make my homemade potstickers (which so many of you have), you can also make this lobster ravioli. It’s basically the same process. 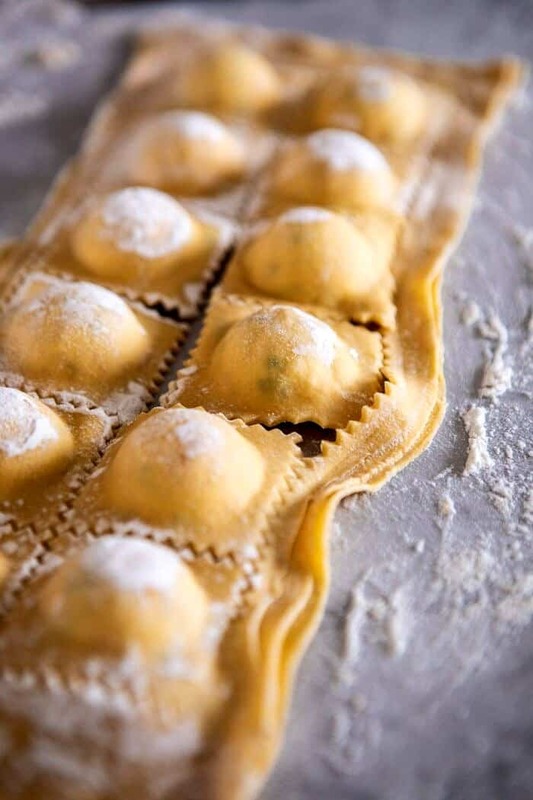 There are some nights, especially a Friday or Saturday night, that I would love nothing more than to spend the night tucked into my kitchen rolling out fresh ravioli. Just as I imagine a true Italian cook doing…not that I am Italian. Though for how much I love pizza, pasta, and burrata cheese you would sure think I am. Anyway, this is actually a recipe I shared way back in my first year of writing HBH. On a whim last week I decided I wanted to revive it, because well, it’s good. This time around, I’ve made the process a whole lot easier. And you guys, it’s truly the most mouth-watering, delicious lobster ravioli. Much better than any restaurant, in my opinion. You’re going to love it, that I am confident of. To start, I did make fresh pasta dough, but don’t stress, you don’t have to make the pasta dough. There are two other options. The first option is to buy fresh pasta dough from your local grocery store. My Whole Foods store carries fresh lasagna sheets already rolled out, which work perfectly for making ravioli. If your local store doesn’t sell fresh pasta, no worries, go on to option number two, wonton wrappers. 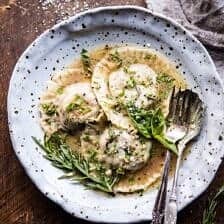 I used them in this mushroom ravioli and they worked beautifully. Either option is great, whether it’s fresh dough, store-bought dough, or wonton wrappers. Use what works best for you. Once you have your dough situation all worked out, make the filling. To keep things simple, to cook the meat, I boiled my lobster tails along with some shrimp. I then gave the lobster and shrimp a rough chop, browned some butter with a little garlic, and tossed everything together with herbs and creamy ricotta cheese. At this point, it’s time to assemble the ravioli. This is my favorite pasta roller, and here’s my very favorite ravioli mold. I’ve tried a lot of different pasta rollers and ravioli molds, but these are the ones I use over and over again. Once assembled, you can either boil the ravioli right away, or transfer to the freezer to cook at another time. Either option works great, but before you boil off the ravioli, make the tomato cream sauce. The sauce is really very simple, just a little garlic, tomato, basil, parmesan, and a quick simmer on the stove. I didn’t want the sauce to outshine the ravioli, so I kept things simple. Simple but perfect, as I like to say. And very creamy and delicious too. Toss the warm tomato sauce with the fresh ravioli, add a sprinkle of parmesan, and top with some fresh herbs. Your fancy dinner will be complete…best enjoyed at home, with extra parmesan, of course. My suggestion? Ditch out a little early from work on Thursday, stop by the store, and pick up some lobster. 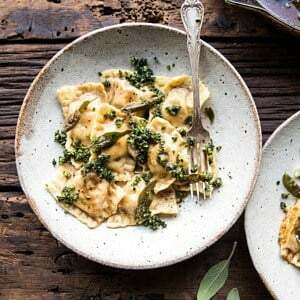 Then make this ravioli for not only a fun Valentine’s day dinner, but a really delicious one too. And since you’ll already be in the kitchen, make these cookies as well. Hey, if you’re doing up v-day, you should do it up right! 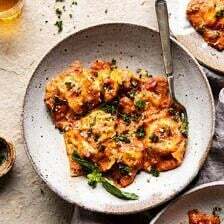 If you make this brown butter lobster ravioli, be sure to leave a comment and/or give this recipe a rating! Above all, I love to hear from you guys and always do my best to respond to each and every comment. And of course, if you do make this recipe, don’t forget to also tag me on Instagram! Looking through the photos of recipes you all have made is my favorite! 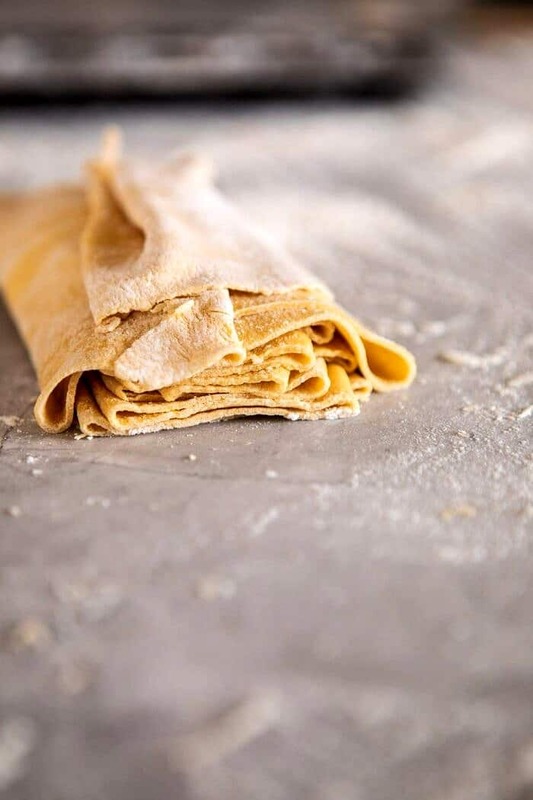 Fresh pasta dough (or wonton wrappers to keep things easy) filled with a simple but delicious nutty browned butter lobster and ricotta cheese filling. 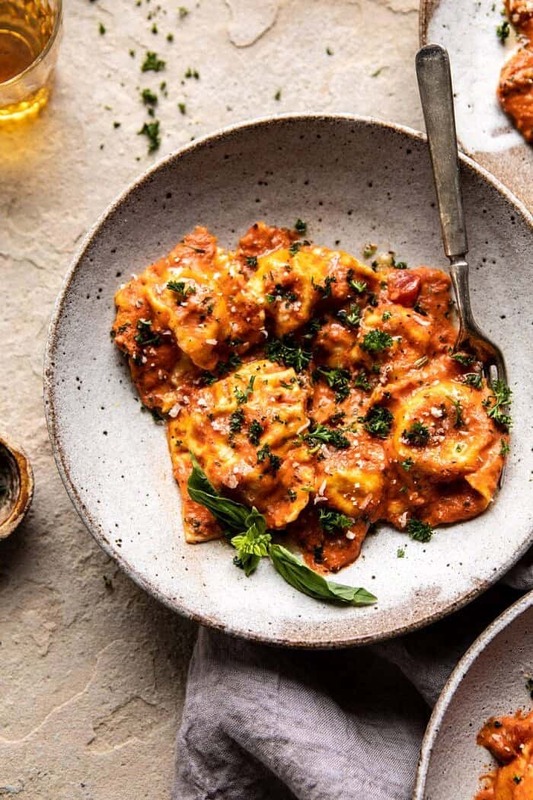 Serve this homemade ravioli with a delicious creamy tomato basil sauce. 1. To make the ravioli. Bring a large pot of salted water to a boil. Add the lobster tails and shrimp and cook until the shells turn bright red and the shrimp pink, about 5-8 minutes. Remove from the water using tongs. Let cool and then remove the lobster meat from the shell. Finely chop both the lobster meat and shrimp. 2. In a large skillet, brown the butter over medium heat, stirring often until the butter is golden and toasted. Add the garlic and crushed red pepper and cook another minute. Remove from the heat and stir in the lobster, shrimp, parsley, lemon juice, and a pinch each of salt and pepper. Add the ricotta cheese and mix to combine. Set the filling aside. 4. To make the cream sauce. Heat the butter and oil over medium heat. Add onions and cook for 5 minutes, until fragrant. Add the garlic and cook another minute. Stir in the tomatoes and season with salt and pepper. Stir and cook over low heat for 15 to 20 minutes, stirring occasionally until thickened slightly. Stir in the milk, parmesan, parsley, and basil, and cook another 10 minutes, until warmed through. 6. Divide the ravioli among bowls and spoon the tomato sauce over top. EAT and ENJOY! Freezing Directions: Once you've assembled the ravioli, arrange the ravioli on a parchment paper lined baking sheet in a single layer, cover and transfer them to the freezer. Freeze 1-2 hours and then transfer the frozen ravioli to a freezer bag. The ravioli can be frozen for up to 4 months. To cook, boil from frozen and add 1-2 minutes of additional cooking time. This certainly looks too good for words! WOW!! Pinned 😉 Thanks for sharing another fantastic recipe!! I love this site , how well you explaing all about coupons , just one question, why don’t you post publix , winn dixie, and other grocery deals? PINNED ! This looks divine, but I think it’s going to be a two-person cooking event. There’s something quite romantic about preparing a wonderful meal with the one you love. Oh my, this looks delish. I love making pasta and with access to fresh lobster every day, I try everything with it as an ingredient. I’ve made lobster ravioli several times, but yours is just a little different. Can’t wait to try it. Oh. My. Gosh. This is fabulous!!!! I have been dying for lobster. Pinned! Uhmmm Yes Please! Thanks for linking at Show Me Your Plaid Monday’s! Wow, this looks amazing! I am a huge fan of lobster anything, so this is just great. Just saw your link over at Skip To My Lou’s link party and it looked so good I had to pop over and check out your recipe! This looks so wonderfully yummy, I’ve never tried lobster but I know I’ll love it! These look so yummy! I found your recipe at Mom’s Test Meal Mondays and had to get a better look. Thanks for sharing! Wow, my mouth is watering!! I love ravioli!! What a rich and fancy dish. Thanks for sharing on Foodie Friends Friday. That looks amazing! I just made homemade ravioli for the first time last week. Your filling and sauce sound delicious. I am pinning this to try next! Looks delicious! I have never thought to use wonton wrappers to make ravioli, but it sure would save a lot of time. Thanks so much for the wonderful idea! Oh, I just got a pasta machine and have been looking for the perfect recipe to break it in. THIS is IT! I love, love, love lobster and the ingredient list has me drooling already. Saved it to my Ziplist so I can give it a try next week. Thank you! No self-respecting Italian would use wonton wrappers to make raviolis. Invest in a pasta machine (the hand crank kind) because once you’ve tasted homemade pasta you will never buy the boxed kind again! I’ve even made mine with whole wheat pasta. I used a pasta machine for this meal and my own homemade noodles. I do agree that they taste amazing! Don’t know what to say. Ok yes I do. I’m very impressed by your blog. You’ve got something that can’t be taught in cooking school. There is a certain skill that some people just have to put flavors together that other people wouldn’t think of and honey you’ve got it. Not to mention a great photographer and writer along with the innovative cooking. That’s a trifecta that can’t be beat. You’re parents are so lucky to have such a wonderful daughter. It makes me even more excited to watch my little girl grow. Awe, thank you Linda! This is one of the sweetest comments I have received!! I am so happy you are enjoying my site and photography. That makes me so happy! Thank you so very much for your kind words. You just made my night so much better! Can I replace the lobster with shrimp? How much should I use? Hey! You can use shrimp. I would use about 1 pound. Hope you love this! this sounds perfect. Ravioli party for a crowd and we needed a lobster ravioli recipe. Can’t wait to make these. I made this with fresh pasta and it’s the best dish I’ve ever made. Fabulous! I shall try this one 🙂 I love lobster and ravioli! This looks great, going to try it for Valentines Day this year. Have a suggested wine pairing? I used wonton skin it came out soggy. I made this using fresh homemade pasta sheets and I can honestly say this dish is the best thing I have ever cooked in my life. And I have 45 more in the freezer! The only changes I made was I added some Vodka to the Tomato Cream sauce, and I buzzed it in a blender for a silky smooth sauce. I also used the meat of 2 full lobsters, claws, knuckles and all. SO happy you loved it, thanks!! Hi! Here is a more detailed post on making ravioli. I think your recipes sound delish! I hope to try several of them soon. By the way…I make an awesome Curried Seafood Stew. If you are interested in the basic recipe, I will try to get it to you as soon as I can. (I’m not a big computer user). Thanks again. This looks incredible! Does freezing it spoil the taste?! I would like to make the ravioli 4-5 hours in advance. Thanks! Hey Julia! Freezing works great, I do it all the time! Enjoy! Yes, that works great. Hope you love this! I only made the sauce, had some packaged lob rav, wasn’t that great, sauce was excellent, am gonna freeze to use later & maybe put some shrimp or mixed seafood in sauce & put over rice. Thank u for a great & versatile sauce recipe. Thank you for sharing. I cheated by using shrimp and lobster ravioli I got from the fresh section at Sam’s. I added some cut up shrimp to the sauce as well. Other than that I followed recipe. Might I say it was simply delish and only took 30 mins. Great meal (with a tossed salad and garlic bread) for a Tuesday dinner. 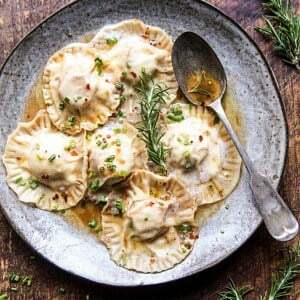 Hello, do you know if you can make the ravioli a day ahead and keep in the refrigerator for about 12 hours before cooking and serving? I made this recipe for my family for Christmas Eve. It was amazing! It was so good I have been requested to make it every year! Thank you so much for sharing this one! SO happy the recipe was a hit! THANK YOU! Have a happy New Year! Absolutely wonderful!! First time making ravioli from scratch and this recipe filled them beautifully! My family raved about them. Would not change a thing and will definitely make again. I made this recipe and was impressed. Excellent instructions. Everything turned out great. I especially liked the hardware tips. I too didn’t have a steamer and used a metal strainer on a pot. A few tips from my attempt. 1. Make sure to keep the underside of the pasta well floured when filling. You say so in your instructions, but it’s quite critical if your doing this on a countertop or you end up with a soggy pasta sheet. 3. I cut the heavy cream to 3/4 cup and used regular pasta sauce (for spaghetti). It worked fine. Thanks!! Those tips are awesome!! So happy it worked out for you! When you freeze them (which I have already done), do you then put them in the boiling water when still frozen, or thaw first. Thank you. Hey Tam! keep them frozen. Let me know if you have questions, Thanks! Great recipe, Thank you. One question. You state lobster tails (preferably wild caught)? Is there any other kind, or are you referring to our Northern lobster, versus the Southern Crawfish? I know a lot of Shrimp are “farmed”, but would be interested to know of any success in raising “farmed” lobster. Cheers. HI! I use wild caught lobster and shrimp. I am not a huge fan of farm raised fish. Happy Holidays! ? This looks great! I want to try this, but one of the guests has a shrimp allergy. Any suggestions to substitute? More lobster? Hey Kay! Yup, i would do more lobster! That will be delicious! Hope you love this! Hi! Yes, more lobster will work awesome! Hope this is a hit! Thanks! Thanks for the reply. I tried this using all lobster, as suggested. I couldn’t find lasagna sheets at the store , so I did it with homemade pasta dough. It was a disaster. I guess because it was a hot and humid day in South Florida, but my dough wasn’t cooperating. The filling and the sauce were both delicious, so my deformed raviolis were still consumed. Maybe I will try again on a dry day. For the tomato cream sauce do you add store bought tomato cream sauce or are those ingredients listed under it what you use to make the tomato cream sauce? Hi! Those are all the ingredients I have listed. No need to buy it from the store. Let me know if you have questions. Hope you love this! These look so good! Can you please adjust one thing in the description though? Ravioli is plural (singular form is raviolo), so raviolis/ravioli’s doesn’t exist. Minor gripe, but I love language and want to honor the Italian word! Looking forward to trying these! Thanks for the recipe! Thanks so much! I will fix that. Hope you love the ravioli! Looks simple enough. I am going to give it a try. Looks simple enough! I think I will give it a try. Awesome. I hope you love it Bill! This was as delicious as it looked! No, better! Made it with my husband when he brought home two steamed lobsters from Wegmans. He found the recipe, I had wontons which I would recommend – made it much easier. Whoa, this was spectacular! I am so happy to hear that you loved this! Thank you Deb! I am so glad you liked this!! And so glad you have a recipe to impress your brother haha! Thank you Ethan! if making these with your homemade pasta recipe, can I freeze them before cooking? What size lobster tails do you use, or how much lobster meat should you have after steaming? How many pieces of ravioli are in a serving for this 128 calorie nutrition chart? I have made these 2 times now and both times they came out great. I used won ton wrappers. Next time I will make them with fresh pasta dough (just got the Kitchen Aid attachments). Hoping they will be even better. The sauce, by the way, can stand on it’s own!! I caught my daughter at the stove trying spoonfuls. That is so amazing! Thank you so much Mary, I am so glad you loved this! 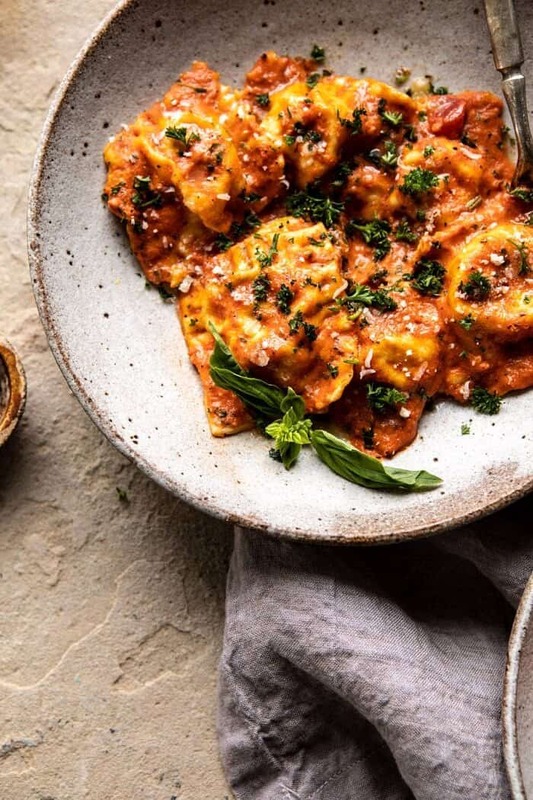 This sauce looks amazing… I like to buy the prepared lobster ravioli from Trader Joe’s and find myself usually serving with a white cream sauce and I’ve been looking for a red sauce to switch it up! Will be trying this tonight and will add shrimp as well! Thanks for sharing! Thank you McKenzie! I hope you love this recipe! This recipe was great! I decided to use fresh tomatoes from my garden and cooked them down with the shells from the lobster for a few hours and it added the best sweet lobster taste to this sauce ! I puréed the sauce before adding the cream and it was rich and smooth and wonderful! Thanks for a great recipe !!! Thank you so much Michelle! I am so glad you loved this recipe! Made this tonight, labor intensive but worth every second! Outstanding meal! Thanks for sharing this excellent recipe with us! I am so glad you loved this Bruce! Thank you so much! Will make sure I buy cold water lobster tails for this going forward as I prefer their taste over those of warm water tails. Hi Amy! I am so happy to hear that you have been loving this recipe! Thank you so much! Kitchenaid mixer with pasta rollers and cutter, and bought myself a ravioli mold. Question, but instead of chopping/mincing with a knife, could I use the meat grinder attachment, or would that be overkill? Sorry if this is a dumb question, but I’m really new t this(at76 years young). I am so glad you loved this recipe, Tracy!! Thank you so much! The timing of this could not be more perfect! I’ve been making my own pasta recently and decided just last night I was going to attempt ravioli this week. Thank you! Fish or seafood, but that’s just me. Thank you for making this dish seem possible! Next time I have more time I’ll definitely try it. I have made the lobster BLTs from the cookbook and it knocked my and hubby’s socks off!!!!!! This is amazing! Going in my meal plan this week! send this over, please. thank you. Such a decadent meal! There’s nothing better than lobster and brown butter! I made these last night. Did the wonton wrapper method because it was a weeknight. They were AMAZING. I ended up adding a little bit more lemon juice to the filling, but I really like lemon. The brown butter is a MUST. Also, my husband is now in love with the tomato sauce. AWESOME RECIPE! why dont you put your videos on youtube? I like youtube much better its easier to access your content. What a dreamy dinner!! My husband and I made this last weekend and are in love!! The sauce is perfectly acidic enough to balance the creamy deliciousness of the ravioli filling. I used fresh lasagna sheets from my local grocery store, which saved a ton of time! The only thing I wish I would have had was a ravioli press, as I tried to make mine by hand and my pasta to filling ratio was a little off, but that was my own fault! We will definitely be making this again for another romantic dinner!! I’ve made this recipe several times and I absolutely love it. My Italian husband hates shellfish but for some reason when I sneak it in to Ravioli he loves it! Highly recommend! !